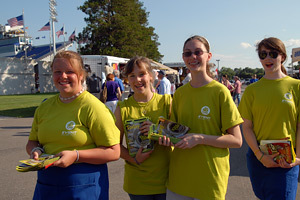 Event volunteers wait for fans to enter the stadium. The first major DCI Tour event of the season, DCI Salutes America on Saturday, June 20, brought together some of the world's best drum corps and some of the nation's finest music educators at the crowd-friendly Navy-Marine Corps Memorial Stadium in Annapolis, Md. While a hard rain during the morning hours and predictions of storms for the evening might have kept some people at home, those who came to the show were treated to the most pleasant weather possible. Those who didn't make the trip out to Annapolis had the opportunity to watch the event from home as part of a free Fan Network Webcast. DCI Salutes America served as a grand finale for MENC: The National Association for Music Education's Music Education Week in nearby Washington D.C., strengthening the blossoming relationship between the two organizations. As part of those events, the Glassmen headed into the National Capital earlier this week to perform at MENC's rally for music education at the U.S. Department of Education. "It was a very great honor just to be asked to participate in these events," said Glassmen drum major Cory Edgar. "As someone who has been touched by music education, it's been really cool to be a part of and support MENC and their efforts to further music education in the U.S." MENC's mission is to "advance music education by encouraging the study and making of music by all." It is the only organization in the country that is concerned with every aspect of music education, including the marching arts. Read about a brand new partnership between MENC and DCI announced at today's event. 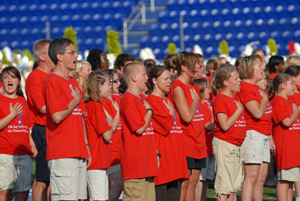 a mass performance of the National Anthem. To kickoff the event, a special presentation of the "Star Spangled Banner" was offered by the brass sections of all five World Class corps in attendance and the U.S. Marine Drum and Bugle Corps, supported by hundreds of on-field student vocalists and music educators from around the country. Barbara Geer, president of MENC, spoke to the audience about the goal of her organization to help teach all American citizens to sing the national anthem. 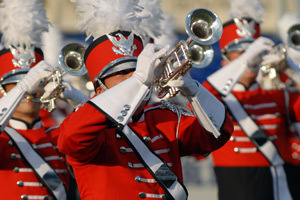 Following, the Marine Drum and Bugle Corps put on a spirited production of American hits and set the stage for the five corps to follow. When the scores were announced, the Holy Name Cadets – who have adopted their original name in celebration of the corps' 75th anniversary this season – finished in first place with a score of 75.30. Carolina Crown followed closely behind taking second place with a score of 74.50. Post-event interview with Holy Name Cadets Drum Major Chris Zenter. "It was a very solid performance," said Mark Whitfield, Carolina Crown drum major. "Head and shoulders above anything we've done so far–the performers were really focused."